Dario Robleto, Setlists for a Setting Sun (Dark Was the Night), 2014, cyanotypes, prints, watercolor paper, butterflies, butterfly antennae made from stretched audiotape of Blind Willie Johnson’s Dark Was the Night, various cave minerals and crystals, homemade crystals, coral, nickel plated sea urchin shells, sea urchin teeth, various seashells, beetle wings, ocean water, pigments, cut paper, mica flakes, feathers, mirrors, plastic and glass domes, digital player, headphones, wood, polyurethane, sound, 61 x 45 x 45”. Looking like a cabinet of sea curiosities and feeling like a ballad, Dario Robleto’s exhibition reveals a burning heart. The packed gallery displays photographs, collages, and sculptural amalgamations made with materials like black swan vertebrae, glitter, semiprecious stones, and whale ear fossils. One of these works, Melancholy Matters Because of You, 2012, is composed of three cast and carved hands that resemble bones but are actually a mingling of bone calcium, resin, dust, pigment, and melted vinyl record collections that belonged to three generations of Robleto’s family. 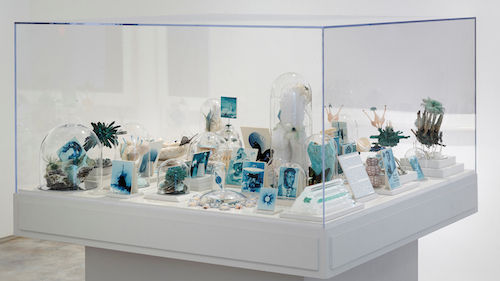 For Setlists for a Setting Sun (Dark Was the Night), 2014, Robleto has assembled earthly, oceanographic, invented, and cosmic references in a museum case containing a butterfly with antennae made from stretched audiotape that once held bluesman Blind Willie Johnson’s plaintive guitar thrum; seashells that seem to have been patiently trimmed with a diamond cutter; sea urchin teeth; and small cyanotype cards with images of Johnson, satellites, and musicologists conducting recording sessions with phonographs. Johnson’s lonely song Dark Was the Night, Cold Was the Ground plays on headphones attached to a stand next to the case, the same recording that NASA sent to space as one of the selections for the Voyager Golden Record time capsule, designed as an attempt to communicate life on earth to extraterrestrials. Encountering Robleto’s work is like reading an aching Valentine written in Morse code. It connects seemingly disparate and vulnerable technologies and forms of expression out of a desire to discover and validate an unquantifiable bliss shared by humans, a feeling which can be lost across space and between cultures and generations.